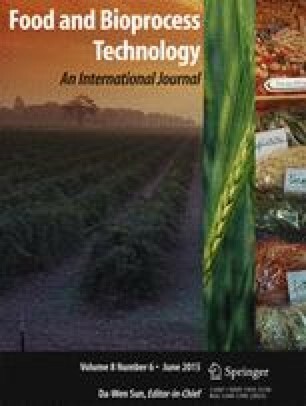 This study investigated the chemical, enzymatic, and physical modifications of rapeseed protein isolate (RPI) to improve its mechanical properties for its use as wall materials for rapeseed peptide (RP) microencapsulation by spray drying. The objective was to determine the effect of protein modification and the influence of the core/shell ratio on microcapsule properties. Results obtained demonstrated that microcapsules derived from the hydrolysis of RPI as wall material showed lower encapsulation efficiency (NE) than the native RPI microcapsules (63 ± 1.0–84 ± 1.7 and 91.4 ± 1.4 %, respectively). Conversely, acylated (degree of acylation (DA) of 47 %) and high pressure (HP) 400 MPa treatment of RPI as wall materials allowed a higher NE to be up to 99 ± 2.2 and 94 ± 1.3 %, respectively. Moreover, the data of the IR spectra curve fitting showed that wall materials obtained from hydrolyzed RPI resulted in greater loss of total secondary structures when compared to the wall material from acylated, HP-treated, and native RPI. Nanomechanical experiments also indicated that the microcapsules from hydrolyzed RPI underwent remarkable softening with an associated drop in Young’s modulus value (245 MPa) when compared to microcapsules with acylated and HP-treated RPI (450 and 310 MPa, respectively). The above results suggested that there might be an excellent correlation between IR spectra curve fittings and the nanomechanical data depicting the microstructural properties of microcapsules. In addition, higher microcapsule size and NE were observed while decreasing the spray-drying yield as the RP concentration was increased. Funding for this work was provided through the Agricultural Science and Technology Innovation Capital of Jiangsu Province (project no. CX (13) 3088) and Universities Natural Science Research Project of Jiangsu Province (project no. 14KJ13550003). The authors acknowledge the financial support of the Natural Science Foundation of Jiangsu Province of China (BK20131435) and the Special Project of State Grain Industry (201413007).